Sainted Cyril, ArchBishop of Alexandria, a distinguished champion of Orthodoxy and a great teacher of the Church, came from an illustrious and pious Christian family. He studied the secular sciences, among which number also was philosophy, but most of all he strove to acquire knowledge of the Holy Scriptures and the truths of the Christian faith. In his youth Saint Cyril entered the skete-monastery of Saint Makarios in the Nitreia hills, where he stayed for six years. The Patriarch of Alexandria Theophilos (385-412) ordained him to the dignity of deacon, numbered him among the clergy and, seeing his giftedness, entrusted him to preach. 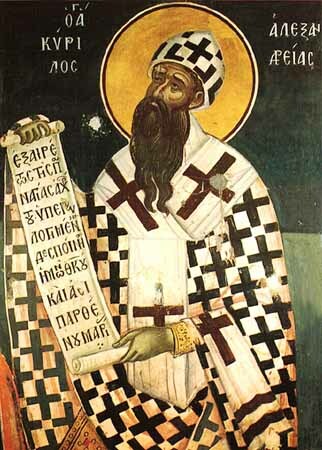 Upon the death of Patriarch Theophilos, Saint Cyril was unanimously chosen to the patriarchal throne of the Alexandrian Church. He headed the struggle against the spread in Alexandria of the Novatian heresy, which taught that a Christian, having fallen away from the Church during time of persecution, is not able to be received back by it again. Saint Cyril, seeing the futility of admonishing the heretics, sought their expulsion from Alexandria. The Jews appeared a greater danger for the Church, repeatedly making riots, accompanied by the brutal killing of Christians. The saint long contended with them. And to end with the remaining paganism, the saint cast out devils from an ancient pagan temple and built on the place a church. Into it were transferred the relics of the holy Unmercenaries Cyrus and John. Still more difficult a struggle awaited the saint with the emergence of the Nestorian heresy. Nestorius, a presbyter of the Antioch Church, was chosen in 428 to the Constantinople cathedra and therein got the chance to widely spread about his heretical teaching, directed against the dogma about the uncommingled union of two natures in the Person of the Lord Jesus Christ. Nestorius called the Mother of God not the Bogoroditsa (Theotokos or "Birth-giver of God"), but rather Khristoroditsa (Christotokos or "Birth‑giver of Christ"), implying that she gave birth not to God, but only to the man Christ. The holy Patriarch Cyril repeatedly wrote to Nestorius and pointed out his error, but Nestorius continued to persevere in it. Then the saint sent out epistles against Nestorianism to the clergy of the Constantinople Church and to the holy nobleborn emperor Theodosius the Younger (408-450) – two treatises with a denunciation of the heresy. Saint Cyril wrote also to other Churches – to Pope Celestine and to the other Patriarchs, and even to monks of several monasteries, warning about the emergence of a dangerous heresy. Nestorius started an open persecution against the Orthodox. In his presence one of his partisans, bishop Dorotheos, pronounced from the church cathedra an anathema for anyone who would call the MostHoly Virgin Mary the Bogoroditsa (Theotokos). Nestorius hated Saint Cyril and brought out against him every kind of slander and fabrication, calling him an heretic. The saint with all his powers continued to defend Orthodoxy. The situation became so aggravated, that it became necessary to convene an OEcumenical Council, which opened in the year 431 in the city of Ephesus. At the Council arrived 200 bishops from all the Christian Churches. Nestorius, awaiting the arrival of the bishop of Antioch John and other Syrian bishops, did not agree to the opening of the Council. But the fathers of the Council began the sessions. The Alexandrian Patriarch Saint Cyril presided. Having examined the teaching of Nestorius, the Council condemned him as an heretic. Nestorius did not submit to the Council, and the arriving bishop John opened a "robber council", which decreed Saint Cyril an heretic. The unrest increased. By order of the emperor, Patriarch Cyril of Alexandria and Archbishop Memnon of Ephesus were locked in prison. And in this measure, Nestorius also was deposed. Soon Saints Cyril and Memnon were freed, and the sessions of the Council continued. Nestorius, not submitting himself to the determinations of the Council, was deprived of priestly rank and by order of the emperor sent to the faraway place Sasim in the Libean wilderness, where he died in grievous torments: his tongue, having blasphemed the Mother of God, was overtaken by punishment – in it there developed worms. Even Bishop John of Antioch and the remaining Syrian bishops signed the decretals of the Ephesus Council. Saint Cyril guided the Alexandrian Church for 32 years: towards the end of his abundant activity the flock was cleansed of heretics. Gently and cautiously Saint Cyril approached towards anyone, who by their own simpleness and lack of knowledge fell into false wisdom. To a certain elder, an ascetic of profound life, – who incorrectly considered the Old Testament Righteous HighPriest Melchisedek to be the Son of God, – Saint Cyril turned with a request to pray to the Lord so that He should reveal, correctly how to consider that righteous one. After three days the elder came to Saint Cyril and said, that the Lord revealed to him, that Melchisedek was high-priest and a mere man. Saint Cyril learned to overcome his prejudice against the memory of the great Sainted-hierarch John Chrysostomos (Zlatoust') (+ 407, Comm. 13 November). The Patriarch of Alexandria Theophilos, by birth an uncle of the saint, was an antagonist of Sainted John, and presided in a council in judgement of him. Saint Cyril from his youthful years found himself thus in a circle antagonistic to John Chrysostom and involuntarily acquired prejudice against him. The Monk Isidoros Pelusiotes (+ c. 436-440, Comm. 4 February) repeatedly wrote to Saint Cyril and urged him to include the name of the great father of the Church into the diptych-list of the saints, but Saint Cyril would not agree. But once in a dream he saw a wondrous temple, in which was present the Mother of God surrounded by an host of Angels and saints, in which number stood also Saint John Chrysostom. When Saint Cyril wanted to approach the MostHoly Lady and offer to Her veneration, Saint John Chrysostom would not let him. The Mother of God asked Saint John to forgive Saint Cyril, for having sinned against him through ignorance. Seeing that Saint John hesitated, the Mother of God said: "Forgive him for Me, since he hath laboured much for My honour, and hath glorified Me among the people calling Me the Mother of God, the Theotokos Bogoroditsa". Saint John answered: "By Thy intercession, Lady, I do forgive him", – and then with love he hugged and embraced Saint Cyril. Saint Cyril repented himself that he had maintained anger against the great saint of God. Having convened all the Egyptian bishops, he made a solemn festal celebration in honour of Sainted John Chrysostom. Saint Cyril died in the year 444, leaving behind many works. In particular ought to be mentioned: Commentaries – On the Gospel of Luke, On the Gospel of John, On the Epistles of the Apostle Paul to the Corinthians and to the Hebrews; also an Apologia in Defence of Christianity against the Emperor Julian the Apostate (361-363). Of vast significance are: Five Books against Nestorius; a work About the MostHoly Trinity; – under the title "Thesaurus", written against Arius and Eunomios; also two dogmatic compositions About the MostHoly Trinity, – distinguished by a precise exposition of the Orthodox teaching about the Procession of the Holy Spirit. Saint Cyril wrote a composition – Against Anthropomorphism, for several Egyptians, who through ignorance depicted God in human form. Amidst a number of works by Saint Cyril are also the "Discussions", among which is the moving and edifying "Discourse on the Exodus of the Soul", inserted in the Slavonic "Following Psalter".